A new device designed by researchers at the University of Toronto's Faculty of Applied Science & Engineering uses a rigorous training regimen to grow small amounts of cardiac tissue and measure how strongly it beats. The platform is ideal for testing the effects of potential drug molecules, and could help bring personalized medicine closer to reality. “Many potential new drugs fail because of toxicity issues, and cardiac toxicity is a major challenge,” says Milica Radisic, a professor at the Institute of Biomaterials and Biomedical Engineering who led the research team. Radisic, who is cross-appointed to the department of chemical engineering and applied chemistry, and her research collaborators build devices that enable lab-grown cells and tissues to develop into 3D forms that more closely resemble those in the human body. Five years ago, they created the Biowire, a platform in which heart cells grow around a silk suture. By pulsing electricity through the cells, the device causes them to elongate and become more like mature human heart cells. Their latest paper, published today in the journal Cell, describes a new platform dubbed Biowire II. It contains two wires made of elastic polymers positioned three millimetres apart, with heart cells forming a small band of tissue between them. Each time the cells contract, they bend the wires. By measuring the amount of deflection in the wires, the researchers can determine the force of the contraction. “The advantage of this system is that it tells us how a given drug molecule is affecting the cardiac output by examining forces of contraction and other key functional readouts,” says Yimu Zhao, a PhD candidate in Radisic’s lab and the lead author on the paper. As with the original Biowire, electrical pulses are used to simulate exercise and “train” the heart cells. Zhao says the team has refined the training regimen to create tissue that is even more life-like than what was possible with the previous device – all in just six weeks. 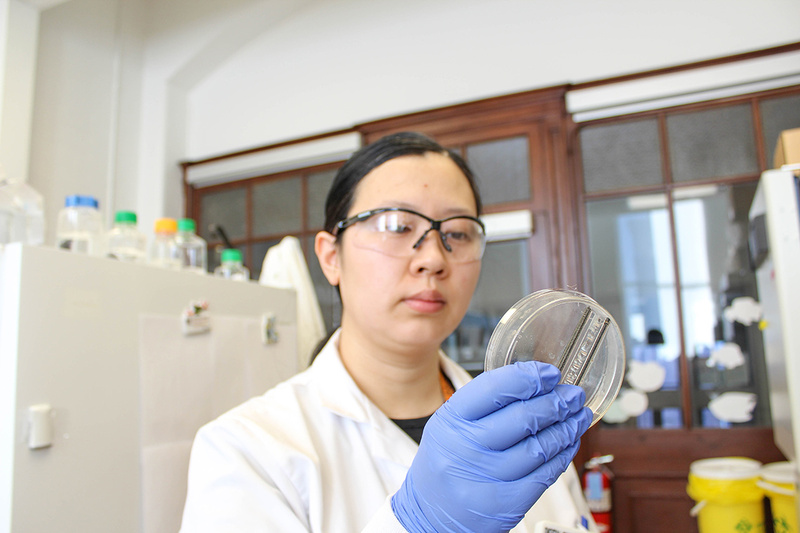 “We have created both atrial and ventricular heart tissues, and we can even grow a heteropolar tissue – one with both atrial and ventricular ends,” says Zhao. “It was a blind trial, nobody in our lab knew which cell line was which,” says Zhao. “But as they grew in the device, we could clearly identify the tissues from patients with the condition by loss of contractility, which is one of the hallmarks of the disease. The ability to accurately replicate the heart condition of a real patient opens the door to new applications in personalized medicine. In addition to studying the progression of disease in a particular patient, the model heart could also be used to screen several potential treatments simultaneously, narrowing in on the ones most likely to be effective. More research will be required before the platform can be used in this way, but Biowire II is already finding commercial application through TARA Biosystems Inc., a spinoff co-founded by Radisic. The company uses its lab-grown heart tissues to carry out cardiac drug testing studies for pharmaceutical companies. Ultimately, lab-grown tissues may one day be implanted back into humans to repair damaged organs. Radisic and her team are pursuing separate technologies to address that challenge, but she says the fact that Biowire II is already having an impact is gratifying. “If our lab-grown tissues can keep dangerous drugs out of the pipeline and help find new drugs to treat heart conditions, it will save thousands of lives,” Radisic says. The team's research was supported by the Canadian Institutes of Health Research and the Natural Sciences and Engineering Research Council of Canada, among others.